Global attention continues to focus on climate change. Endless controversy and confusion bolster the “blame-game.”It is a hot topic, chiefly in the scientific and political arenas. The causes of this universal problem are vague and unclear, yet many theories are presented as absolute fact while lacking foundation. However, we do have confidence that throughout history, weather patterns have changed from time to time and will continue to change. And while we agree there is an increase of extreme weather globally, we are assured from the Bible that our God controls the vast universe. We have an eternal foundation; the Word of God presents undeniable, indisputable facts. 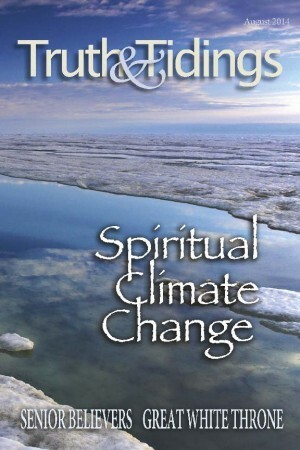 There also has been “climate change” in the spiritual sphere. Consider the current spiritual conditions in contrast with those at the beginning of the Church dispensation. The early church flourished in a mighty and marvelous way, even to the miraculous. The record of the Acts of the Apostles stands in stark contrast to present day Christianity. We have somehow lost our way. The spiritual climate at the dawn of Christianity was marked by power, love, and obedience. The divine presence of Christ was exhibited both individually and collectively and the reverence of God was predominant. But, soon departure from God and His Word changed the spiritual climate. Thankfully, from time to time there were seasons of recovery and revival – precious and infectious. How refreshing and welcome it would be to have a return to that spiritual climate. Consider the answer and also the cost to return to the spirituality of early Christianity. We acknowledge that it wasn’t perfect, but it was powerful. We all make a contribution to this climate. When we look through the spiritual barometer the reason for this climate change becomes obvious. Consider one major answer: there must be a return to prayer life, both privately and publicly. Prayer was the greatest weapon in the spiritual arsenal of the early church. While we greatly value the spiritual advancement in apologetics, the increase of spiritual tools at our disposal, and the blessing of God-given gifts raised by the Holy Spirit, these inestimable blessings are not the real answer to our spiritual poverty. Indeed, the advancement in modern technology raises the red flag of warning. Time consumed on the Internet, Facebook, etc., has often eaten like a cancer into our spiritual growth and deprived us of precious time once spent in prayer to God. Have we not lost power with God and power with man? Prayer is the spiritual measure that has been rightly called “the powerhouse” of every local church. But prayer has been neglected. No revival can take place unless we face this spiritual challenge. Is it not true that, locally, our smallest assembly meetings are the prayer meetings, both mid-week and before the gospel meeting on the Lord’s Day? We have time for business. Time for play.Time for sports. Time for beaches. Time for vacation. When we stop prioritizing prayer we become powerless. If we took an average of how much time we spend each week in prayer, most of us would be alarmed and humbled. This is the need of the hour. We certainly need prayer warriors willing to wrestle with God. We need those who are willing to wait in His presence, and cling by faith to the divine promises. This is the secret for revival. “Where prayer is, revival cannot be far behind” (A.W.T.). Prayer removes formalism, legalism, and coldness. We need all hands on deck! We need women like Hannah as well as men like Elijah. It is worthy of note that the prayers recorded in our Bible were not formal but fervent, they were not cold but warm, and they were not dry but moist with tears. Our collective prayer meetings should be marked by short and definite prayers; in private there is no time limit. This is a challenge with cost involved, but the compensations have everlasting blessing. Look in – this brings confession. Look out – this brings compassion. Look up – this brings confidence. Revive us again! But the Word of God predicted such with forecasts that are clear. And the climate change we hear about, for millenniums God has sent. The tornadoes and the hail that falls that cause mankind to shake. That God speaks through these wonders upon the sea and land. The hail will fall, the snow comes down, and storms will come and go! All these are clear reminders that our God is in control. Yet man goes on denying God Who declared these His Word. But we forget sin is the cause that gives us all these fears. Yet man is the big problem and has brought this dreadful mess. ‘Twas in this world the Son of God displayed God’s wondrous grace. That we could dwell in heaven above throughout eternal days. Please don’t delay but come at once and don’t His pardon shun. My friend, accept His offer and you’ll be in heaven with Him. For He knows all climate changes that for the ages He ordained. That proves that man is fickle and his thoughts they are unsound. How good if they would bow to Him and accept His faithful Word.